Three numbers — but for many, those digits together represent something more than a numerical value. In just about every area code across the United States, you'll find people wearing t-shirts and hats customized with their own region's three digits, a numerical fragment of a collective identity. People tattoo the numbers on their bodies. They display them proudly in their social media profiles. Those in the 814 have similar pride — although many aren't aware of the area code's distinctiveness. It's one of Pennsylvania's original four area codes (along with 215, 412, and 717) and the only one left with its original boundaries. It is the only territory in Pennsylvania that uses a single area code — the rest have been overlaid with a second — and it sprawls a massive zone covering northwestern Pennsylvania down through the central part of the state bordering Maryland. It encompasses all or parts of twenty-seven different counties, including cities as widespread as Erie, DuBois, Punxsutawney, and Johnstown. Area codes, including the 814, were created for more practical reasons than collective identity, of course. Such codes were established in 1947 with the implementation of the North American Numbering Plan. This was devised by the Bell System and AT&T as a means for creating a consistent consumer dialing plan throughout the United States (as well as neighboring North American countries). 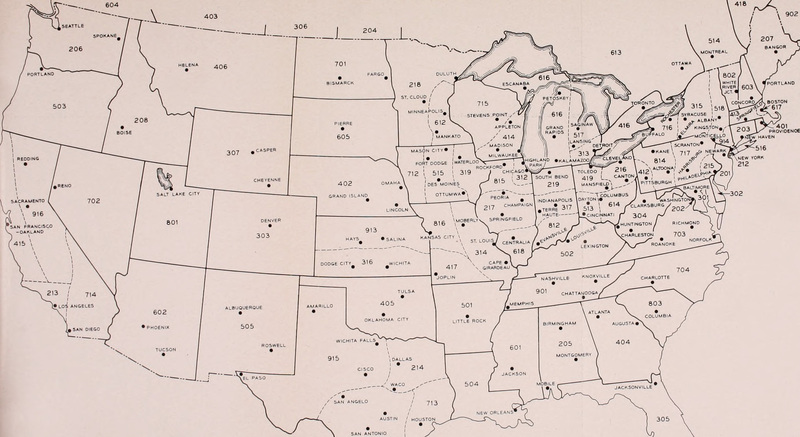 It divided geographic regions into number plan areas (NPAs) with unique number plan area codes. These designated three-digits could then be applied to existing seven-digit numbers. The original plan was designed so that the first number would be between 2 and 9, the second would either be a 0 or 1, and the third could be any single digit. When they were first implemented, the codes were used by switchboard operators who would connect long-distance callers. By 1951 though, direct distancing dialing started to become available for callers themselves and was in widespread use by the 1960s. "The entire program will take many years to realize," a 1952 essay in The Bell System Technical Journal reads, "but it is one which must be accomplished in order to … make it possible for a customer at any telephone in the United States and Canada to reach a telephone anywhere in the two countries by dialing without the assistance of an operator." Area codes weren't necessarily popular across the population either, particularly as they were being implemented as telephone exchange names (using letters) were being replaced by all-number calling. "[Bell Systems] presupposed the blind acceptance of a benumbed and be-numbered public," TIME Magazine proclaimed in 1962. "They were wrong: the telephone company is now facing a minor rebellion." An Anti-Digit Dialing League (ADDL) formed to oppose the new system. Some called operators just to harass and confuse them. Others had more practical strategies. "There are legal channels to voice our protest and we plan to use them," one ADDL member told a Utah newspaper in 1962. "We are getting a hearing before the state public utilities commission and we will tell them that the company is not being realistic in expecting people to react like machines." Now, people fiercely defend their area codes — and each code can serve just shy of eight million telephone numbers. This made things a little tricky with the spread of fax machines and pagers followed by the explosion of personal cell phone use. 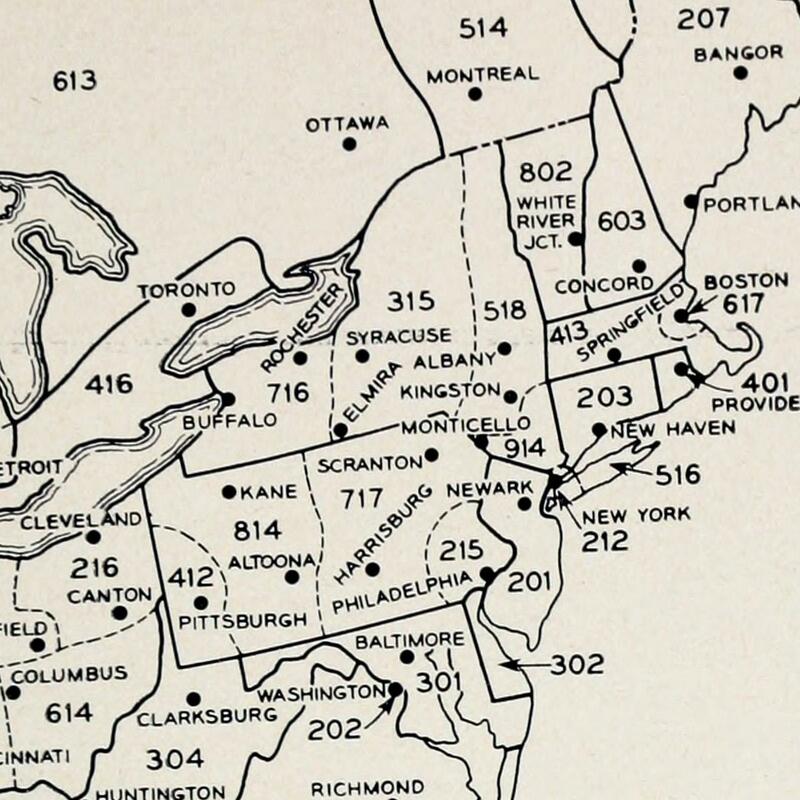 Most number plan areas throughout the United States have been altered in some way or, as previously mentioned, been overlaid with a second code — but the 814 has remained the sole Pennsylvania area code intact. 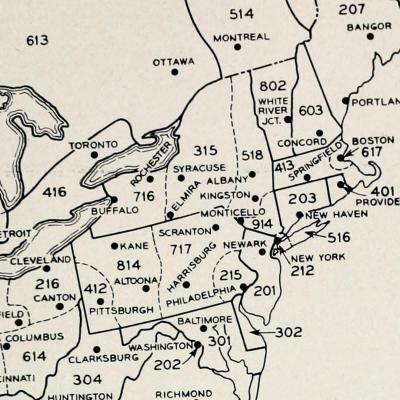 The Bell System technical journal map (1952). Back in 2010, it became a rather contentious issue when the Pennsylvania Public Utility Commission approved to split the 814 geographically in two. The northwestern portion, including Erie and most of Crawford County, was to be reassigned the new code of 582. People were understandably up in arms, particularly business owners who argued that implementing such a change would disrupt their operations and add frustrating expenses to alter signage, advertising, forms, menus, and so on. Others demanded that the commission introduce the 582 as an overlay number instead, for new numbers only, which had been the original recommendation anyway — but some argued that this would require mandatory 10-digit dialing, even for local calls, and could also affect the programming of alarm and fire systems. "With either a split or overlay," Ken Springirth wrote in the Erie-Times News, "[the] cost will hit the consumer." In 2012, the commission voted to dismiss the plan due to over 40 formal public petitions being presented — but they warned that the issue will inevitably need to be revisited. Nils Hagen-Frederiksen, Press Secretary for the Pennsylvania Public Utility Commission (PUC), explains that area codes are overseen by the North American Numbering Plan Administrator (NANPA) and usually two years before an anticipated exhaustion of an area code, they will file a petition with a state's PUC. "The petition, along with input from the public, telecommunications industry and other stakeholders, is then considered by the commission," Hagen-Frederiksen explains. "Their current forecast is for the 814 area code to reach exhaustion in mid-2021." He adds that while changing area codes does inspire significant public interest, a new overlay code of 223 was put into service in the same geographic region as 717 this last August and there have been "no reported problems or technical issues." Still, for now, maybe postpone getting those 814 tattoos — but hey, in the meantime, you can still buy the shirt.